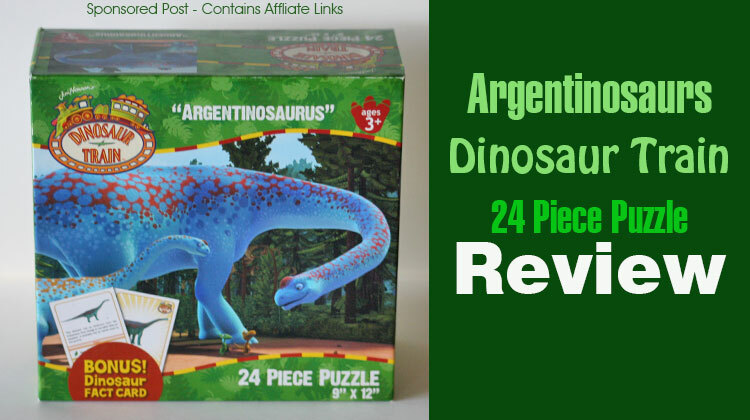 Share the post "Argentinosaurs Dinosaur Train 24 Piece Puzzle Review"
One of the ways I found to keep my son busy is to buy him puzzles. Puzzles have become a nice quiet game in our household where everyone of all ages enjoys putting them together. The Dinosaur Train puzzle is great when you have a busy 3 year old that keeps you going nonstop and you just need a couple of minutes to relax. Jim Henson’s Dinosaur Train includes 24 pieces that is 9”X12” in size for ages 3 and up. The puzzle is great and very challenging for my son. You can see him working really hard to get each piece of the puzzle to fit in the right spot. It might take him a couple of times and a little help to get the right piece to fit. Once we have it done then we have to start all over and do it a couple more times. The Argentinosaurus puzzle comes with a bonus dinosaur fact card. We like to go over the dinosaur fact card after we are done with the puzzle and talk about what the dinosaur ate and how big the dinosaur was. Then my son will act out and pretend he is an Argentinosaurus, and stomp around the house saying he has a long tail and a big mouth with sharp teeth. Dinosaurs tend to be one of his favorite toys! Did you know that the puzzle is also made in the USA and its earth friendly? The puzzle is made with 90% or more recycled materials and printed with vegetable based ink. Also the puzzle is 100% biodegradable. I love the fact that the company is thinking of our kids. There are times where I still catch my son putting things in his mouth and you don’t know how safe the toy is and where it was made. Jim Henson’s Dinosaur Train puzzles are by far one of the best puzzles after taking it apart and putting it back together as many times as we did it still is holding up.